Gaming in e-learning may not be what we are familiar with, but it is becoming the future of workplace training. A recent study showed that the digital gaming industry accounts for 87% of the global market, spurred by 2.2 billion gamers across the globe (Newzoo). Playstation, Nintendo and internet games like Minecraft are starting to offer things nothing else does, and people are learning from them, even if it isn’t in the way we are used to. With over a quarter of the world’s population involved, it’s wise to ask: what can we learn from them? What can we take from the online video games we spend so much of our time on to help with our learning? With its scope to simulate real life, encourage teamwork and create a social workplace, its benefits are infinite; it becomes ignorant not to include it within corporate e-learning programmes when it even has the potential to revolutionise corporate culture for the better. Through blending gamificaton with traditional training techniques, or by taking the leap into a totally game-based learning platform for your business, it inarguably equips your workers and your team to stay up to date with the world’s booming tech developments. With Generation Z, or the iGeneration, starting to make their first steps into work, and with millennials expected to take up 50% of the talent pool by 2020 (ATD), we need to accommodate this technological shift to keep businesses in the loop. Why is Gamification Necessary in Corporate eLearning? Boosts Engagement – People are naturally drawn in by new, exciting ways to learn. Offering game-based e-learning has already been proven to result in increased worker engagement throughout training. By making use of of gaming to replicate practical scenarios, or by integrating it into the everyday workplace, workers can enjoy a stimulating learning experience. Not only this, but businesses won’t see this engagement restricted to training, and you’ll leave your employees coming back for more. 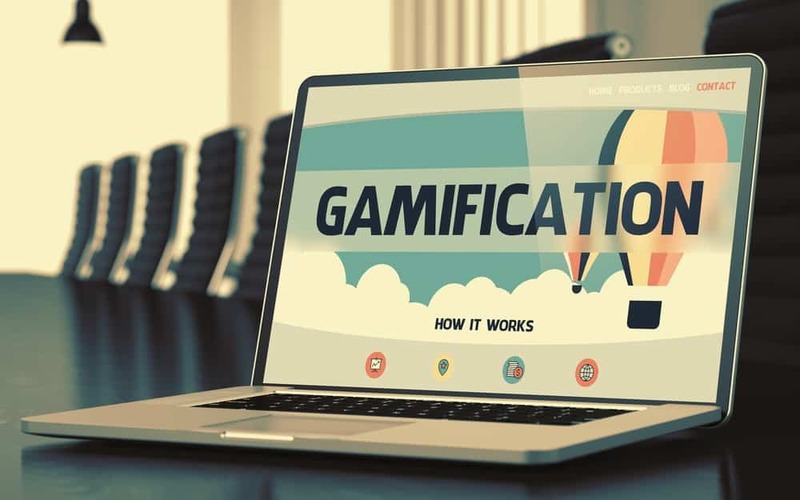 Makes Learning Memorable – Gamification operates on the principle that learning works better when manageable, bite size chunks of information are delivered in a new setting. Overloading the brain with large amounts of often mundane detail isn’t conducive to learning, as it is unable to remember that much, especially if it’s only conveyed once. Encouraging staff to play games injected with the relevant information means they are more likely to have fun, and therefore remember everything they need to for a much longer period of time. Learning Becomes Habitual – If workers are receiving training on a gaming platform, either by having it blended into their workplace or topped-up regularly, learning becomes natural to them. Indeed, learning this way can be done on mobile devices, which means workers can be involved on the go, and thanks to the primary gaming element, it isn’t distinguishable from the time they would usually spend on their phones. This, in turn, can help companies cultivate organic learning, where it becomes part of their corporate culture, and allows a certain sense of pragmatism that enables them to deal with unexpected issues. There’s Less Pressure – Sometimes, training places a lot of pressure on staff, which means they don’t perform on the spot as well as they would usually in work. With game-based learning, the platform allows their potential to be maximised. It provides them with space to make mistakes and rectify them, without experiencing too much stress, and without having implications from their actions that could be collateral and all too real. Not only this, but gaming removes the need for people to feel like they have to adapt their learning to other styles. As most people enjoy gaming, and it can easily have elements of both auditory, visual and kinesthetic learning, people can learn at their own pace and in a place more comfortable for them rather than squeezing themselves into a box. Improved Feedback – One of the main attractions of gamification is that it gives instant feedback to players, feedback that has charted the learner’s progress and taken it into consideration when formulating a response. With instant feedback comes instant reflection. Staff can see what they’ve done wrong, see trends emerging in their training, and adapt what they’re doing to improve their scores and therefore their skills. It’s better for employees but also employers, as it can help cut down on time often spent on giving feedback to staff, and reduce training costs in the long run. Identifies strengths in a team – arguably the main element to gaming is its emphasis on teamwork; the same can be said for work. The best way to ensure good teamwork is maintained is to convey its importance to staff from day one, on a platform where traits of staff in the workplace are mirrored. This way, employers can take note of who performs well together, who doesn’t, and why. It’s Social – Most staff prefer to work and train in a social setting as it can boost their morale in the workplace. It is a widely known fact that happy staff means happy customers. Gamification can help bring out the social side to workers who may usually not be confident enough to speak out, and introduce a healthy competitive component which can translate into higher revenue. Ultimately, it builds a support network among staff, resulting in a positive working environment. Creating such a platform can be difficult, especially if you don’t have the software or an in-house design team to help. Having the right games to learn with can enhance social capabilities, increase a deeper understanding of the self and promote a culture of learning. Just because a business doesn’t have these tools, it doesn’t mean they shouldn’t enjoy the benefits that come with them. Luckily, there are ways this problem can be resolved so that your workplace training doesn’t suffer. Hiring out services that specialise in making bespoke game-based e-learning materials can really help you achieve a customised, high-quality learning platform that can reap its benefits now and in the years to come.